Welcome to the start of Airi’s Potion! For those who aren’t familiar with her, our host introduces herself: She’s Suzuki Airi from ℃-ute, which is a 5-person group under the Hello! Project collective. Having entered the world of entertainment in her second year of primary school, she’s now been in the industry for 15 years. Well, while she might have been around for a long time, she’s still 22, young and spirited! As well as being an idol in the group ℃-ute, she’s also a 4th year university student, as well as a model for the magazine ‘Ray’. Personality-wise, she’s curious and would like to try out all sorts of things. She hopes that her personality will show through this radio show. The programme’s title, ‘Airi’s Potion,’ was thought up by Airi herself. She hopes that the topics being discussed and the song selection will act as a potion that heals the listeners – a magical 30 minutes. For the show’s very first song, we have a song from her group, ℃-ute. This song is a relatively recent release, from their album ℃maj9. With lyrics written by a female university student, Airi enjoys this song, it fits her present situation spot on. It’s also a stylish song, one that Airi hopes that you’ll listen to at a concert someday. And it’s got to be Taiwan-style reflexology: not for relaxing, but as therapy. She highly recommends it if you haven’t tried it before – you can even cure back pain through reflexology. With her interest in health and food, she can sum her hobbies in one word: Learning. Favourite sport(s): Hmm… I’d like to learn to play golf!! This is new to Airi as well – she didn’t know that her official day of entry into H!P was the day of ℃-ute’s formation. She clarifies further: it’s not just that she’s able to sleep anywhere, it’s that she can end up drifting off to sleep at any time. She’s even fallen asleep while showering in the tub. It was quite a waste of water, and plus, she caught a cold. She was also surprised at how pruny her fingers got… So she reminds herself to be careful and not fall asleep in the tub again. Well, a plus point of being able to sleep anywhere is that more sleep equals less stress. Airi also enjoys eating. About 80% of her mind is spent wondering about things like ‘What’s for dinner tonight?’ During primary school, she most enjoyed the times when she’d walk back from school – she’d catch the scent of grilled saury wafting from the houses in the neighbourhood. And so, if you have any stories about good food, please share them with her! In this segment, Airi would like to heal you with music. Her first pick is Demi Lovato’s La La Land. Starting from the intro itself, Airi finds it to be a good song. Airi first came upon this song when she had planned to meet up with a friend in Shibuya. In a rare turn of events, Airi was actually there pretty early, so she went to Tsutaya by herself. She went to the music preview corner to listen to some music, and to look cool, picked out a Western song. And this was the Western song that she just happened to pick up. To Airi, it was a fateful encounter, it was love at first listen. This led to Airi listening to even more songs. Airi’s always liked rock, and she liked the sound of Demi Lovato-san’s music, as well as her looks. Above all, Demi Lovato’s singing is exquisite, so Airi would like you to have a listen. Airi once again declares her love for the intro. She often listens to songs on shuffle on her iPhone, and it perks her up whenever this song pops up and she hears the intro. She’s really a fan of this song, and recommends you add it to your music playlists. Next song is BoA’s Kimochi ha Tsutawaru. For Airi, this is a memorable song. When she was in her first year of primary school, she requested for a Mini Hams CD for Christmas. Santa Claus was so generous that he left her 11 CDs. Among them was BoA-san’s Kimochi ha Tsutawaru, which introduced Airi to both the song and BoA-san. When she was still in kindergarten, she’d always sing a song in front of her grandpa before going to school. It was a custom: he’d give her some guidance, and then she’d go off to school. When Airi had to perform a song at school, her grandfather picked this song. So she sang it for a while. That also happened to be around the time of the Hello! Project Kids auditions, and after wondering what to sing, she chose this song. She’s never really mentioned the reason why she picked the song: in addition to the many parts that required singing in falsetto, there were also ad-lib parts in the outro – or rather, the outro was basically a series of ad-libs. Airi had mastered those parts in the outro and wanted to perform it. But as they only had to sing a single verse and chorus, Airi could only keep the self-satisfaction of mastering the outro to herself. She’s continued to like this memorable song, and has sung it at her birthday events and at fanclub events. Airi’s grateful to this song, and it wouldn’t be an exaggeration to say that without this song, we wouldn’t have the Suzuki Airi that we have now. Listening to this song reminds Airi about how much she loves singing. She remember her competitive, childish self practising this song. They’re also requesting song suggestions for the programme. The first theme is ‘Songs I’d like to listen in a convertible automobile’. Airi’s never been in a car with its top down, like the ones you can see in American movies, but she’d like to ride in one with a low windscreen. The programme is asking for an exciting song that you would listen to as you ride in a convertible, heading towards the sea. Next theme is ‘Songs I’d like to listen to while swinging in a hammock’, a complete 180 from the previous topic. Airi finds it difficult to get into hammocks – it’s troublesome when one leg’s in while the other still isn’t. But once you get in, it’s just so blissful that you forget about the hot summer, you just chill. The programme would like a song that would go with that. Airi then takes some time to promote the features of this digitally broadcast show. One feature of note is that you can see pictures on your phone during the broadcast, such as this portrait of her father, drawn by her mother. Airi’s mother is a carefree spirit, in a good way, so she’ll suddenly start doing strange things. One morning, when Airi woke up, there were lots of portraits of her father drawn on small pieces of paper, stuck here and there with cellophane tape. There was even one on the washroom door. When Airi asked her mother why she’d stuck all these drawings around the house, her mother replied that she wanted to make everyone smile in the morning, so she had drawn their father. Airi: In my mind, I was thinking about how delightful my mother was. The one pictured above has been enlarged. Her mother highlights the slope of the eyebrows as the feature. Ever since Airi was small, her mother had always drawn her father in this way, which Airi finds to be a show of her mother’s unwavering devotion to her father. 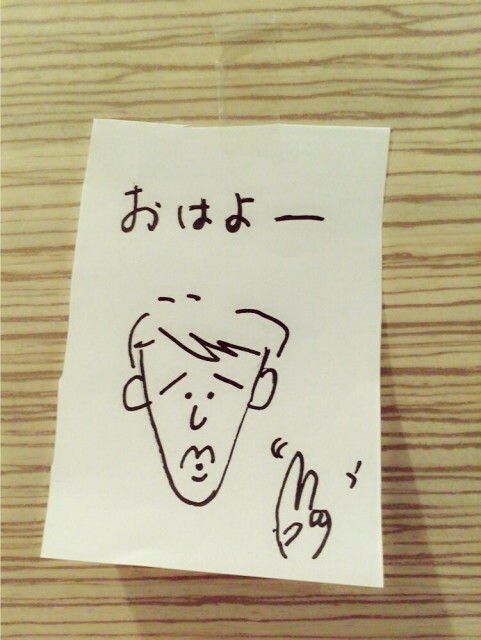 While her mother has drawn other things, Airi herself finds this drawing really cute. 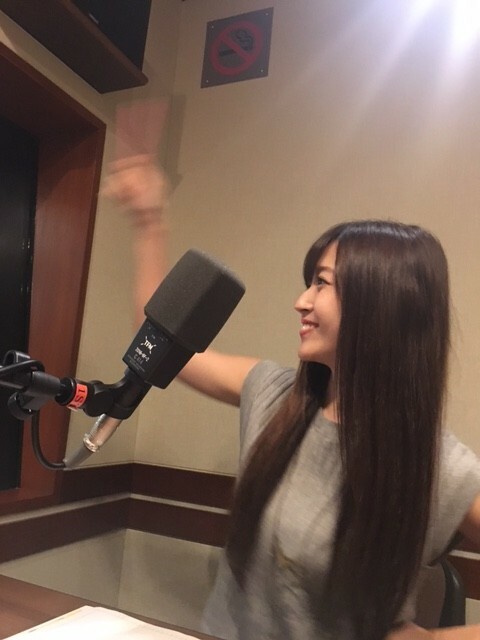 Coming to the end, Airi asks how we found the first episode of her radio show. Personally, Airi really enjoyed herself. She rarely gets time to speak just on her own. And in her 15 years in the entertainment biz, she doesn’t think that she’s actually had the opportunity to be calm and just talk by herself. 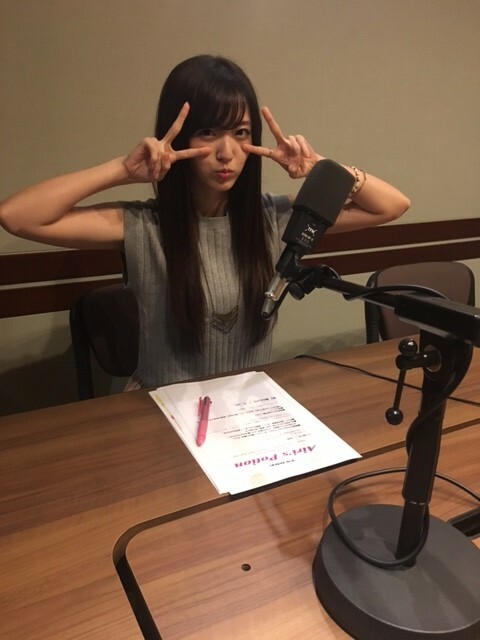 While she may be known as ‘Incomprehensible’ Suzuki Airi, she’d like to know your thoughts about the programme. After she plugs future concerts and events, we come to the final song: Ariana Grande’s Focus. As for her reason: During ℃-ute’s spring tour Airi was given the opportunity to have a one-day-only Suzuki solo corner as a reward for a certain programme. Since she was given the freedom to do whatever she pleased, she wanted to perform this song at first, but picked a different song after going through a lot of discussions. But she really likes the lyrics, which paint the image of a strong, cool woman who has confidence and keeps her head up. Just like the woman depicted in the song, Airi too would like to keep her head up, and have confidence. Thank you very much Skoban. Enjoyed a lot.